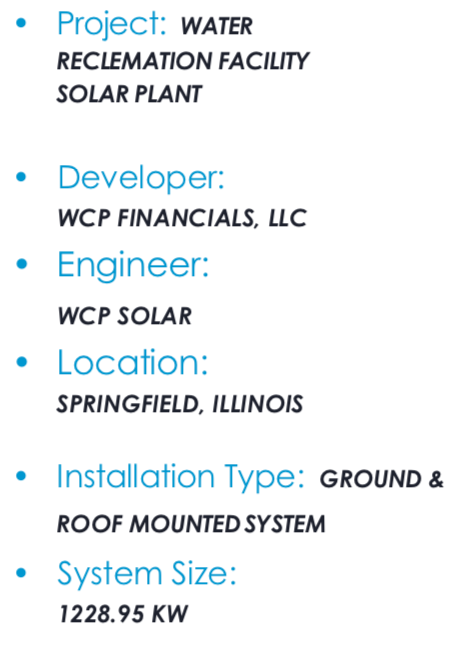 WCP Solar was contracted to design and construct a ground & rooftop mounted solar system for the City of Plano Water Reclamation Facility, located in Plano, Illinois. This ComEd grid connected Distributed Generation system will generate enough electricity to provide power to more than 78% of the facility electrical needs. This project is sized at 1228.95-kWp1, using 3,367 JASolar JAM72S01-365/PR Monocrystalline panels rated at 365-W for the ground and rooftop mounted solar system. The system employs 13 Solectria PVI 60TL and 2 PVI 36-TL string inverters appropriately sized to convert the DC energy produced by the solar plant into AC energy. In addition to providing significant energy savings, the solar system will produce approximately 1,600 Solar Renewable Energy Credits (SREC's) annually. WCP Solar will maintain and service the solar plant for 25 years. The Solar System will be the largest ground and rooftop mounted system in The City of Plano, Illinois.